Best-selling author and talented cook Robert Blakeslee has done it again. In Your Time to Cook, Robert crafted a true first cookbook that teaches kitchen basics and cooking fundamentals. Now, with Your Time to Bake, he has taken the same comprehensive approach to turn non-bakers into successful creators of cakes, cookies, pies, and other delectable baked goods. The cookbook begins with helpful information on baking essentials ingredients, equipment, and common baking techniques and terms. A fantastic array of easy-to-prepare recipes follows, including a delectable assortment of cookies, brownies, pies and tarts, cheesecakes, muffins, quick breads, and puff pastry creations, as well as luscious frostings, fillings, and toppings. A chapter devoted entirely to decorating techniques guides you in putting the icing on the cake as well as the frosting, edible fondant flowers, and much, much more. 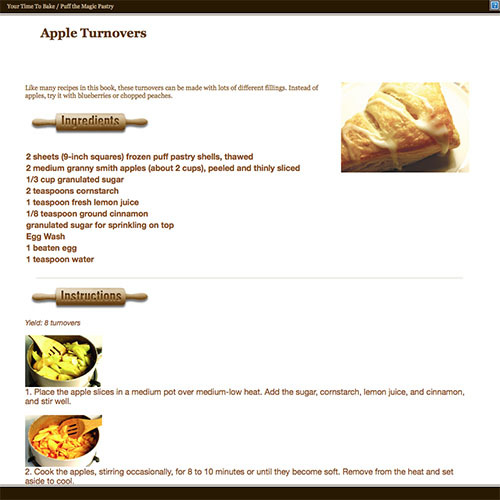 #1 Best-Selling Recipe App with millions and millions served! Have Your Pie and Eat It Too! Is It Icing or Frosting?